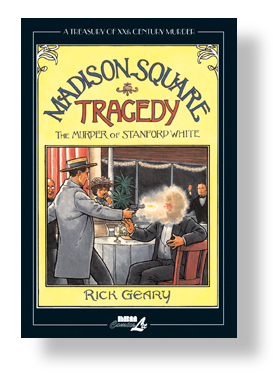 To celebrate Rick Geary’s new book, LOUISE BROOKS: DETECTIVE (Diamond Code: MAR151423 ) , NBM has filled Diamond Previews Magazine with Geary gems. 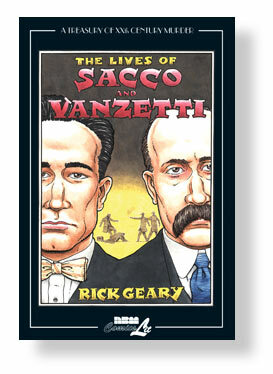 We are printing the TREASURY OF XXth CENTURY MURDER classic: THE LIVES OF SACCO AND VANZETTI in trade paperback format, presenting the uneasy case of the two supposed anarchists now in a more affordable format. When the hardcover edition premiered in 2011, it was on various Best Graphic Novel lists for the year. 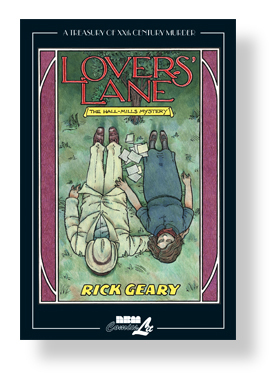 Rick Geary tackles the most controversial case of the 20th century. Anarchists Sacco & Vanzetti were accused of robbery and murder but so many supposedly damning pieces of evidence were questionable their guilty verdict elicited massive protests around the world. Geary presents us with all the twists and turns, appeals and dubious evidence after presenting us the human face of the two men, demonized by many, turned to martyrs by many others, in his usual unflappable way. “One of The 13 Can’t Miss Graphic Novels of 2011. Other recent Geary Murder stories include these two thrillers. You won’t find them yet in the collected COMPENDIUM editions. Be sure to order your copy today from your favorite comic book store in March’s Diamond Previews Magazine.